Make a Twine Game in 40 Minutes: An intense aesthetic design select-em-up, now available! *Mouse's underside: roll it around a flat surface to control the on-screen arrow. *Mouse's left pressure plate: deploy a C.L.I.C.K charge, used to activate the ancient Hyper-Link artifacts that you may encounter on your quest. You are a ship, lost in the depths of Anti-Space. What is there to do? This game is very simple. A dispenser releases a finite supply of balls. 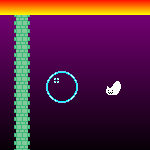 The longer you bounce the balls, the more points you gain when they vanish off the bottom of the screen. On each bounce, the ball's point value increases by the number of times it has already bounced - so repeatedly bounced balls can, after a while, become very lucrative indeed. You have 1024 balls and have to get as high a score as you can with them. What's the most profitable way to do so? I'm not sure. Work it out yourself. A TranCendental visual experienCe. A Crazy, Clever, trippy and enlightening vision of a bright mind. There is a way to win, so technically, this is a game. Use the mouse to move and click to fire. Probably a huge CPU hog. wacky zany fun! jump across the various carnival attractions and don't get snatched by those mean ol' elephans!